Forum Index > Off-topic Talk > Good buy? Posted: Thu 09 Mar, 2006 12:49 pm Post subject: Good buy? Hi , i was asked if i wanted to buy one of the Lord of the Rings sword replicas, it´s the Strider Ranger sword, the seller wanted 95$ for it? Anybody who knows anything about these swords? Is it a good buy? If it's the officially-licensed United Cutlery version, then those go for about $150-175 USD on the internet, so $95 is fair if the sword is in good condition. As far as not wanting to hang a useless sword on your wall, the sword you are talking about (if it's the UC version) is made for display only and has a 420 stainless steel blade and rat-tail tang, so it isn't in any way a "usable" sword. I think its safe to say that almost without question, any swords made as replicas of those seen in movies are useless. If you want a functional Strideresque sword, how about the ATrim Borderwatch over at http://www.christianfletcher.com ? It sells for a lot more than the one from United Cutlery, but quality and functionality cost more. I have a few of these, they're what got me started with swords. I've now progressed to only spending money on real swords. I don't have the Ranger Sword but I've held one, it weighs 4lb-8oz, no distal taper, false edged, looks good as far as a wall hanger goes. It is purely decorative. My 2cents-save your money for the real steel. Exceptions will be those found on Albion's Filmswords site. Also, the Windlass Kingdom of Heaven line doesn't look too bad, for the price. I stand corrected. That looks beefier than I would have expected; however, you still don't want to swing around a 4 lb. stainless decorative sword with what appears to be about a 3/16" thick, half -threaded (only threaded on two sides from what I can see in the pic) nub holding the whole thing together. Also, the guard and pommel are made of mystery metal as far as I know: Probably some form of zinc alloy only O.K. on a purely decorative piece. Anybody know exactly what is used for guards by United Cutlery for fantasy pieces ? Sorry if a bit off topic. Oh, saving for an Albion seems like a better idea. Zinc alloy would be my guess for pretty much all the hilt furniture on UC's pieces: cheap, low melting point, supposedly offers very even casting properties, etc. Heck no, neither would I. I noticed the flat sides on the threads as well - looks like a major comprimise even with the thicker tang. Still, it's an interesting thing for UC to even bother with. I wonder about the quality of the UC Lord of the Rings "Museum Collection", which I noticed while browsing at Kult of Athena. The copy says: "...The full tang blades are forged from high carbon Toledo steel, made in Spain. The hilts are crafted utilizing precious metals, high quality woods, and top grain leathers...." As an example, see this Museum Collection version of Gandalf's Glamdring. Of course, at US$530, this one is pretty pricey, and getting into Albion/A&A territory. It's only getting into this territory price wise Steve. The Museum Collection swords are claimed to be fully functional by UC. I do not have the MC Glamdring myself but people who do say the blade edge does not have functional edge geometry and there is no distal taper in the blade. 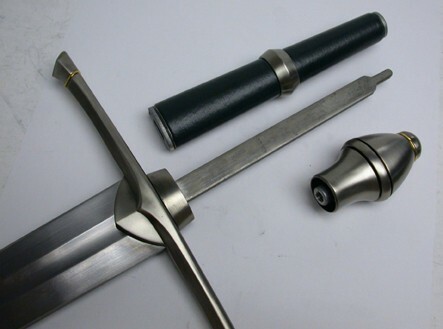 There have been instances of the swords arriving to customers with pronounced bends in the blade. This is information I have seen written by others with photos to support, but with these issues I think you can make your own assumption about the functionality of these blades. ...but with these issues I think you can make your own assumption about the functionality of these blades. But, with the glassed-in wooden cases, I imagine that they function quite well as wallhangers for LOTR fans. Maybe Steve, but I don't think the Albion Filmswords are intended for anything other than decoration. They're certainly not made primarily with the intent to handle well. I can't speak regarding The Kingdom of Heaven, so perhaps you might be right. Well, I haven't personally handled anything available for sale on that site. And certain pieces, like those of the Conan series, probably only handle well if you're built like Arnold in his prime. But I assumed (dangerous word, I know) that other pieces, such as those from Timeline, would be more typical of other Albion pieces in their functionality. And then, there are also the Del Tin pieces, whose handling, from what I have read, probably ranges from good to bad, depending on the model.